Rate this Article Gods of Gold is a 5 reel, 25 payline slot game. Prepare to dine with deities in this progressive jackpot game. 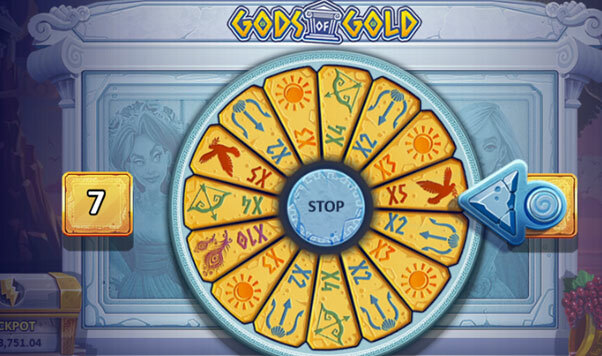 Gods of Gold slot takes you back in time to the Age of Gods in ancient Greece. This mythical adventure is laden with bonus symbols, wild symbols, lightning wilds, wheels of fortune, and a monstrous progressive jackpot. With 5 spinning reels and 25 fixed paylines, players are assured of feature-rich entertainment from the very first spin. You’ll be scampering up Mount Olympus to meet the mighty Zeus and his family. When the jackpots start raining down in this game, they are blessed with the Midas touch. Zeus stands proudly behind the progressive jackpot casket, which holds a treasure trove of riches. Each spinning reel features 3 rows of symbols. These include 3 gorgeous Greek Goddesses and 2 Greek gods. The low-paying symbols include 10, Jack, Queen, King and Ace. These low stakes symbols combine with Bonuses, Wilds, and Lightning Wilds to form winning combinations. Several in-game features including the Wheel of Fortune with its 2 stages of play ramp up the action for the ultimate thrill ride for slots fans. Gods of Gold slot rolls out the red carpet for players. For starters, you will be dining with the mighty Zeus who can be seen drinking from his golden chalice. When you land 3 Bonus symbols anywhere on reels 2-3-4, you will initiate the Bonus Feature. The bonus game begins with the Wheel of Fortune. Players have 20 seconds to stop the bonus wheel from spinning. The Wheel of Fortune will grant you a prize multiplier and pick a bonus game for you. There are 4 items in each bonus game, and you’re required to choose 1 item to determine your prize. When the Lightning Wild forms on the third reel, players will enjoy two possible outcomes – up to 3 re-spins with Sticky Wilds staying in place, or 2 – 4 Sticky Wilds anywhere across the reels. The Lightning Wild remains on the third reel, as 25 paylines are activated at all times. The Wild Symbol is represented by the Acropolis. It substitutes for other symbols to form winning combinations except for the Lightning Wild and the Bonus Symbol. The Lightning Wild features 3 bolts of lightning. This feature is activated when the symbol forms on the third reel. Players will enjoy a random number of re-spins and extra wilds. During the Wheel of Fortune Bonus Round, there are 2 stages of play. You must spin the wheel to determine your multiplier and then you can initiate one of the bonus games. Your bonus winnings will be multiplied by your total bet to determine your payout. The 5 unique bonus games include Feathers, Archer, Dove, Sun, and Trident. The progressive jackpot is randomly awarded to players, meaning that no special symbols are needed to win the prize. To win the progressive jackpot, your best bet is your biggest bet, since all 25 lines are in play. All winning combinations pay from left to right on the reels, and bonus wins are added to payline winnings. Watch the game’s video clip is festooned with excitement. Its majestic theme is evident throughout, and you will feel as though you are feasting with the Gods as they enjoy fun and games up above. This 5-reel, 25-line slot game can be enjoyed in a demo play mode and a real money mode – it’s your call. The brown-haired goddess is the high-paying symbol, and when you land 5 matching symbols you will win up to 1,500. Of course, the big prizes are available with the bonus games and the progressive jackpots. Autoplay functionality is also available, where players can spin a pre-set number of times at fixed bets per payline. This is a wonderful way to sit back, relax and enjoy Gods of Gold slot while you’re feasting on delicious purple grapes in your toga! Practice in demo mode, and once you’re ready to soar with the eagles – play for real and win!